When confronted with tragedy, violence, and injustice on a global scale, it’s common to feel helpless and paralyzed. Hearing about devastating situations can overwhelm us with sadness, anger, fear or despair about a problem that feels far beyond our reach. It’s just too hard and too big. So we freeze. Or look away. Or move on. That is a normal initial response. But it doesn’t have to be our final response. In fact, it must not be our final response. Not when people are in dire need of help that we can provide. We must move beyond inaction. Yes, Aleppo breaks our hearts. Yes, ISIS makes us furious. Yes, we’ve all been paralyzed by the scope of the problem and unsure of how to move forward. But we can’t stop here. We must figure it out—one boldly uncertain step at a time. Because there are things we can do to help in the wake of tragedies that feel so far beyond our reach. There are things you can do. While it’s true that there is no one thing you can do to singlehandedly change the situation in Aleppo, you’re a critical part of getting people the help they need. 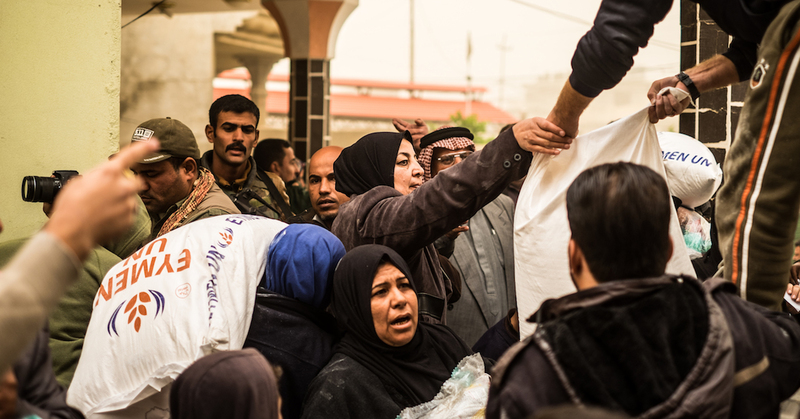 It’s true that you can’t feed all the people in Mosul or liberate them from ISIS by yourself… but without you, there would be families who didn’t eat or get the care they need. Matt, in Australia, asked himself this question, and his answer was swim. So he set up a fundraiser and asked people to donate a few dollars for every lap he swam in an Olympic-sized pool. A few days later, he swam 100 laps and raised $7,000 for Aleppo families. He and his friends raised enough to feed 280 families for a month. Two-hundred and eighty families. For a month. There are businesses donating portions of their proceeds, creatives making special editions of their art and music, people asking for donations in lieu of birthday presents, and single moms giving until it hurts. Kids are particularly audacious in their belief that they can make a difference, because no one’s ever told them otherwise. Two little girls in Minnesota, first and third graders, were moved to action when they heard about the kids who need heart surgeries. They decided to raise enough money to pay for one by making a deal with their mom—they would sew or hand-make all the gifts they would give for a year, and their mom would “buy” the presents from them instead of buying them from the store. They started last summer and they’ve nearly reached their goal of $650. They will save a life. By sewing aprons and potholders and thinking outside the box. We have a lot to learn from kids like Ava, a passionate five-year-old who donates the money she makes selling cupcakes and wants to be famous for loving people. And CeeCee, who, at thirteen, decided to knit and sell these adorable miniature chickens to raise money for refugees. These kids are helping as many people as they can, rather than lamenting the fact that they can’t help everyone. I wish I had space to tell all of the beautiful stories of how this community is creatively showing up for the people in Iraq and Syria. There are so many great stories, and we are inspired by each and every one of them. So what can you do? Only you can answer that. But you can do something. If you’ve been watching the situation in Iraq and Syria from the sidelines, overwhelmed by the atrocities and feeling helpless, make 2017 the year you decide to jump in. Please join us by choosing to pushing through the pain of knowing what’s happening. Refuse to be paralyzed by the flood of negative emotions. Netflix and chill won’t resolve these issues. We need active partners in this work. Partners like you.